Boundary of Lewisham, Deptford in Greater London. This seat was created in 1974. It has remained largely urban in its constituent areas which have been altered on reform by the Boundary Commission very lightly overall. The area of Deptford wholly within the seat was a major London dockyard and in its early history contained chandelries, repair yards, connected with the Royal Navy, later having a high concentration of London's expansive import and export wharves and warehouses; this extended well within the 2010-drawn confines of the seat towards New Cross which had major railway yards. The seat has been won by three Members of Parliament, all of which were and remained during their public service members of the Labour Party. The 2015 result made the seat the 23rd safest of Labour's 232 seats by percentage of majority and the 9th safest in the capital. 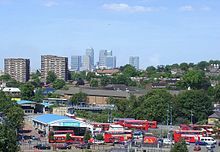 This constituency takes in Lewisham's northern tip – a short stretch alongside the Thames – along with the Deptford and New Cross districts, and the centre of Lewisham itself. These are historically some of the more deprived in London with high crime rates and social problems, counter to this, more upmarket housing developments are springing up as former industrial sites are cleared away as part of an ongoing rejuvenation process. To the South East of the seat, Lewisham town centre fades imperceptibly into Ladywell. The area is relatively affordable, given the short commuting distance to Central London and Canary Wharf, via the Docklands Light Railway and South East Main Line. Goldsmiths, University of London and wider halls of residence and this is a popular living area for those staying and studying in Greater London, giving a substantial student minority to the electorate. At the Western extremity of the seat, just inside the current boundaries, is the New Den, home to Millwall FC. Lewisham Deptford has been one of Labour's safest London seats since its 1974 creation – it was the party's 25th safest in Britain at the 2001 election – though social change in the last decade has seen things become a little more competitive; the most popular opposition in 2005 and 2010 was formed by the active Liberal Democrat party in the area. In terms of share of the vote, it received the 44th largest Labour vote in 2010, of the 650 constituencies. 1974-1983: The London Borough of Lewisham wards of Brockley, Deptford, Drake, Grinling Gibbons, Ladywell, Marlowe, and Pepys. 1983-2010: The London Borough of Lewisham wards of Blythe Hill, Crofton Park, Drake, Evelyn, Grinling Gibbons, Ladywell, Marlowe, and Pepys. 2010-present: The London Borough of Lewisham wards of Brockley, Crofton Park, Evelyn, Ladywell, Lewisham Central, New Cross, and Telegraph Hill. The constituency covers the northern and north-western parts of the London Borough of Lewisham. The Fifth Periodic Review of Westminster constituencies which redrew this seat in 2010 also resulted in the creation of a new cross-borough constituency of Lewisham West and Penge which takes electoral wards from Lewisham and Bromley. ^ "Statement of persons nominated and notice of poll, Lewisham Deptford" (PDF). lewisham.gov.uk. Retrieved 20 May 2017. ^ "Lewisham Deptford parliamentary constituency". Election 2015. BBC News. 8 May 2015. Retrieved 8 May 2015.